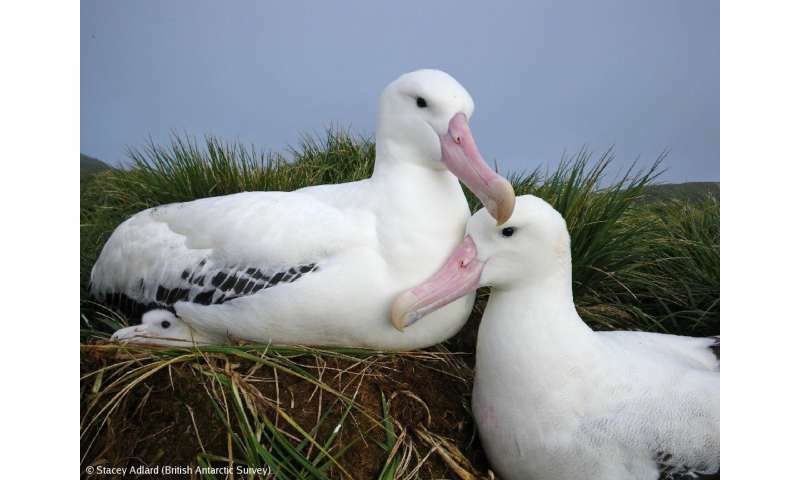 The populations of wandering, black-browed and grey-headed albatrosses have halved over the last 35 years on sub-antarctic Bird Island according to a new study published today (20 November) in the journal Proceedings of the National Academy of Sciences. The research, led by scientists at British Antarctic Study (BAS), attributes this decline to environmental change, and to deaths in longline and trawl fisheries (known as bycatch). Albatrosses are the world's most threatened family of birds. There are 22 species; according to the IUCN Red List, 17 of these are 'Threatened with extinction' and the remaining five are considered to be 'Near-threatened'. BAS scientists at Bird Island have been monitoring the populations since 1972. By analysing the breeding histories of more than 36,000 individually ringed albatrosses, researchers have found decreases in the survival rates of both adults and juveniles, causing serious declines in population growth rates with long-lasting effects. "Our study shows that bycatch in fisheries and environmental change both contribute to reducing the survival rates of the birds. While we know population sizes were affected by bycatch from the mid 1990s, more recent climatic changes including stronger and more poleward winds, increased sea surface temperature and reduced sea ice have worsened the impacts. We also found the grey-headed albatross population was particularly affected by the climatic event of El Niño, which coincided with increased fishing activity in their foraging areas . El Niño reduced the amount of food available so the birds probably switched to feeding on discards behind fishing vessels, increasing the number being hooked on longlines." "This is the first comprehensive study at South Georgia and one of the few globally to examine the impacts of both climate change and fisheries on populations of long-lived seabirds. Identifying that bycatch is having a major impact on grey-headed albatrosses was unexpected, as mortalities of this species during setting of longlines are rarely recorded by observers on board fishing vessels. The results underline how important it is to improve fisheries management. Whilst BAS has worked with Commision for the Conservation of Antarctic Marine Living Resources (CCAMLR) to introduce measures that have effectively eliminated bycatch around South Georgia, evidence from our long-term monitoring shows that more is needed elsewhere in the Southern Ocean to avoid the unnecessary deaths of tens of thousands of birds each year."